After the death of Prophet William S. Crowdy on August 4, 1908, Chief Evangelist Joseph W. Crowdy assumed the leadership of the Church of God and Saints of Christ, fulfilling his 1906 appointment by Prophet Crowdy. Joseph Wesley Crowdy was born on November 8, 1875, in Westwood, Prince George’s Country, Maryland. He was the fourth of nine children, born to Caleb and Fannie A. Crowdy. Joseph W. Crowdy was the second cousin of the Prophet William S. Crowdy. During one of Prophet William S. Crowdy’s visits to Maryland, he met Joseph W. Crowdy along with a few of his other relatives. This meeting happened prior to the prophet receiving the Revelation. After meeting his cousin on that occasion, the Prophet returned to his home in Guthrie, Oklahoma, and went about his daily occupation. 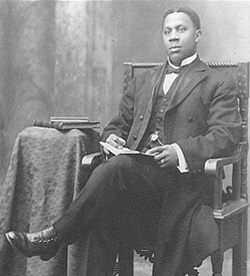 In 1891, at the age of 16, Joseph W. Crowdy moved to Washington D.C. with his brother, Horace Crowdy II, and two friends, to sing for a living. He aspired to become a great singer and later sang with a quartet in the Washington D.C. area. In 1902, Joseph Crowdy was ordained an Elder by Prophet William S. Crowdy in Washington D.C. and was later assigned by the Prophet as the Assistant Pastor in Danville, Virginia. In addition, the Prophet appointed Elder Crowdy as the State Evangelist of Maryland. During the District Assembly held in Boston, Massachusetts, in 1903, Prophet William S. Crowdy appointed Elder Joseph Crowdy as an Evangelist-at-large and member of the presbytery broad. At the 1904 General Assembly, held in Washington D.C., the Prophet appointed Evangelist Crowdy as “Chief of the Pulpit”. 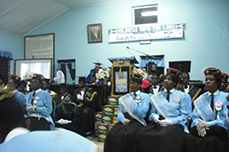 Between 1909 -1916, with Chief Bishop Joseph W. Crowdy as leader, the Church expanded and new Tabernacles established. He was ably assisted by Bishop Plummer whose administrative and preaching abilities were tremendous assets to the Chief. The two men worked harmoniously as they furthered the work of Prophet William. S. Crowdy.